A unique and precious face mask rich in minerals, aloe vera, shea butter, oligoelements and lactic acid. It is a great multitasker which removes dead skin cells, improves elasticity, remineralises the skin while hydrating and nourishing it! Pink clay is the mildest of all clays, thus ideal for sensitive skin use as well as mature skin. EcoBeauty is an EcoLuxe natural skin care brand with a focus on high quality organic, ethically sourced ingredients. The concept is built around the botanical studies of Swedish botanist, Carl von Linné. Apply mask to cleansed skin. Leave on for ten minutes, then rinse thoroughly. For best results, use the mask once a week. 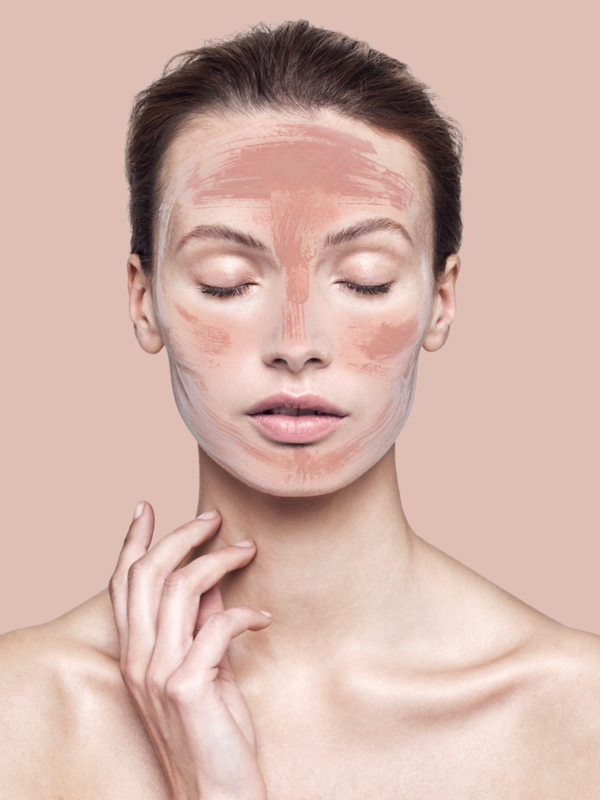 For best results, use EcoBeauty Pink Clay Mask once a week. Natural Pink Clay helps to purify and cleanse skin by absorbing grease and impurities, which in turn helps to clear pores. It also promotes a smoother, healthier complexion by regulating skin’s oil levels and absorbing excess shine. Pink Clay is rich in many naturally occurring oligo-elements and minerals such as copper, selenium, magnesium and zinc, which are essential to helping nourish and condition skin as well achieve and maintain a beautiful, radiant complexion. Thanks to its many skin-benefiting qualities, natural Pink Clay is vital to EcoBeauty Pink Clay Mask. The pink clay is very precious and quite rare therefore there are very few products in the market. Organic Peppermint is extracted from the flowering tips of Mentha Piperita plant and is renowned for its distinctive, refreshing scent. Peppermint helps skin look brighter and feel revitalised, reinvigorated and soothed thanks to its natural cooling properties. This makes it an ideal addition to EcoBeauty Pink Clay Mask. For centuries, rich Shea Butter has been prized for its skin care benefits. Even Cleopatra and the Queen of Sheba were early users. This soothing butter protects and cares for skin to keep it feeling soft, moisturised and supple. It also helps to gently condition skin for a luxurious feeling. Together with Pink Clay and Peppermint, organic Shea Butter helps give your skin a little more love in EcoBeauty Pink Clay Mask. The Pink Clay remineralizes the skin with essential micronutrients, Organic Mint for an invigorating action and Organic Aloe Vera to prevent dehydration. 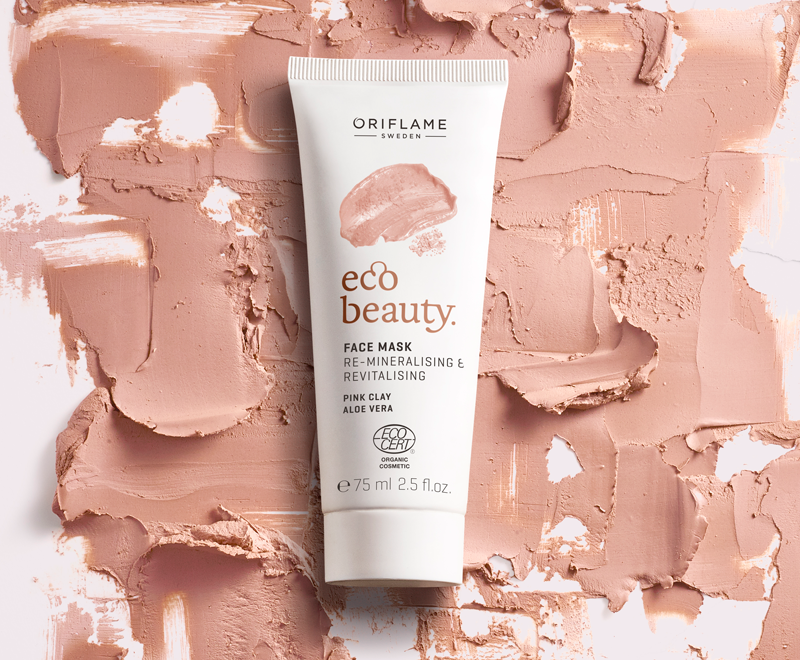 The Oriflame EcoBeauty Facial Mask is ideal for skin that needs extra care. Give your skin a little more love with EcoBeauty’s restorative beautifying mask. Enriched with Pink Clay to help re-mineralise skin with vital minerals and oligo-elements essential to revitalising skin and maintaining a healthy, radiant complexion. Contains precious, skin-loving Organic Aloe Vera, Shea Butter and Peppermint to help soothe and nourish skin and help balance its hydration levels. A perfect treat for skin at the end of the day or whenever skin needs a little extra love. Suitable for all skin types. Certified Organic.